"I started out with 70 books, and now I have a collection of more than 4,800," said Mr. Soriano. This began as a necessity; then it became an obligation; and after that a custom. "Now," he said, "it's an institution." 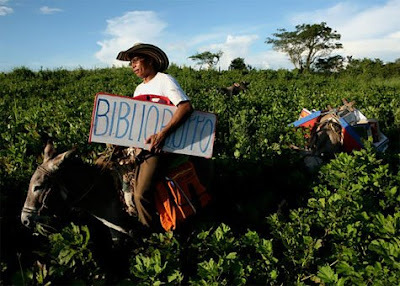 Nice NY Times article & photo gallery about Colombian Luis Soriano and his burro bookmobile. Also, donkey-delivered library services in Zimbabwe.